Lumenis Duet Light Sheer is the “gold standard” laser hair treatment for dark pigmented hair. It allows for faster and less painful treatment for the larger area. Why Use A Laser To Remove Hair? Standard methods of hair removal including waxing, shaving and electrolysis are temporary, time consuming and may be painful. The laser can remove hair in a short amount of time and can result in a reduction or removal of hair. This allows you to spend your valuable time doing other, more enjoyable activities. This laser works by first seeking out pigment in the unwanted hair, and then vaporizing the hair shaft and root. After the first exposure to the laser, most of the hair in the treated area falls out only to regrow again in a few weeks to months. Some of the hair may not return for many months or may be permanently removed. However, this cannot be guaranteed with just one treatment. While up to 30% of laser-treated hair may not regrow after any one treatment, most patients find it necessary to have several treatments. The number of treatments necessary for satisfaction varies between 6 and 8. Darker skinned individuals may require more treatments. Treatments are performed every 4-6 weeks. Following any hair removal treatment, there may be some irritation or redness at the site exposed to the laser. This lasts between a few hours to a few days. Some people, especially dark-skinned individuals may develop a fine thin scab that peels off in 4-7 days. This is because the laser beam is attracted to pigment found in both hair and darker skin. If this occurs, apply Aquaphor or Vaseline twice a day. In some individuals, the treated area may temporarily darken for a period of time. We have special treatment to address excessive pigmentation or skin darkening. In rare instances, people who are prone to pigment loss after injury may also experience loss of skin pigment after laser hair removal. For most, permanent hair removal means that the hair will never regrow. However, some patients will experience some hair regrowth at the treated site after several months to several years. This is because, in spite of effective laser treatment, some hair has the ability to repair itself even after a long period of time. No matter what type of laser is used, the patients who receive the best results have dark hair and fair skin. For some with fine or lighter hair, our hair removal treatments may not result in adequate removal. This may occur even with many treatments. 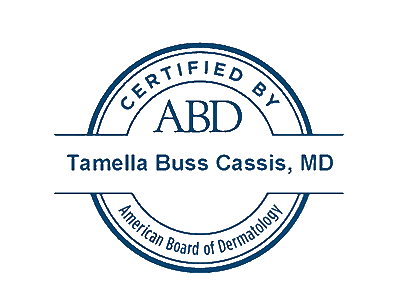 The staff at Cassis Dermatology and Aesthetics Center can perform laser hair removal.